No. 11 Virginia Tech will travel to Clemson on Saturday afternoon for an ACC matchup with the Tigers. The Hokies are sitting at 18-4 overall, with a 7-3 record in conference play. They’ll be looking for their fourth Quadrant One win of the season against a Clemson team that is 14-8 overall and 4-5 in the ACC. Clemson is No. 43 nationally in the NET rankings, and they have one Quadrant One win against Lipscomb. If they beat the Hokies (No. 10 in the NET) on Saturday, they’ll have two Quadrant One wins, and folks would begin to talk about the Tigers as a potential NCAA Tournament team. Right now, they are among Joe Lunardi’s “next four out” in his Bracketology. In other words, this is a huge game for the Tigers. They know they’ll be facing a wounded Virginia Tech team, yet a highly-ranked Virginia Tech team. On one hand, Clemson has been a strong defensive team, and they’ll be facing a Virginia Tech team that is limited offensively without Justin Robinson. On the other hand, the Tigers aren’t very good at defending the three-pointer, and they are a bad three-point shooting team in their own right. 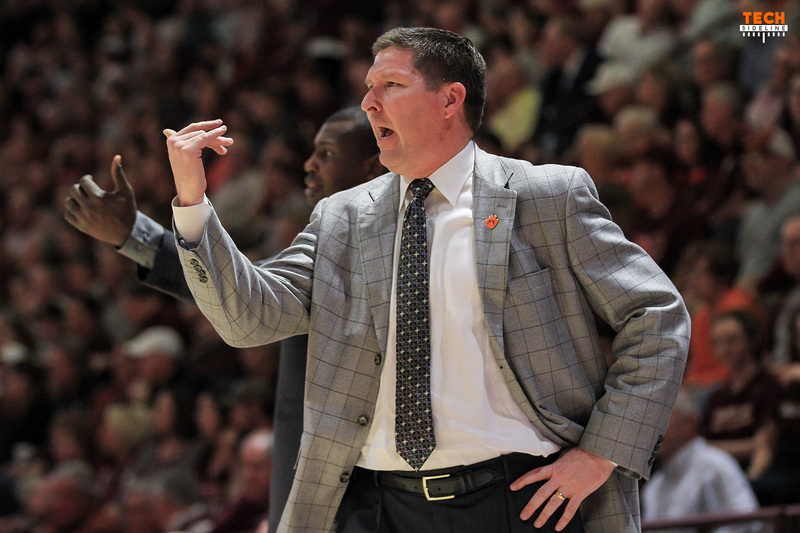 The Hokies want to keep the ball out of the paint and make the opposition settle for three-point shots, and if the Tigers make their three-pointers at their usual rate, they aren’t going to score a lot of points. Only 26.1% of their points have come from outside the three-point line, which ranks No. 310 in the country. Clemson is a very experienced team that starts three redshirt seniors and a regular senior, plus brings another redshirt senior off the bench. G Shelton Mitchell (6-4, 200, r-Sr.): 11.2 ppg, 2.4 rpg, 67 apg. Mitchell is a returning starter who played his first season of college ball at Vanderbilt. He’s only a 29.3% three-point shooter, though he’s taken more three-pointers (92) than any other player on the team. G Marcquise Reed (6-3, 188, r-Sr.): 19.1 ppg, 5.1 rpg, 62 assists. Reed began his career at Robert Morris, but transferred after one season. He’s developed into Clemson’s top player. F David Skara (6-8, 213, r-Sr.): 8 ppg, 4.4 rpg, 35 assists. The Croatian began his career at Valparaiso. He is Clemson’s top three-point threat at 39.3%. F Aamir Simms (6-7, 248, So. ): 9.3 ppg, 4.5 rpg. Simms has 88 three-point attempts, second-most on the team. He shoots 34.1% from the outside. Simms went to Blue Ridge School in Palmyra, VA (Fluvanna County). F Elijah Thomas (6-9, 245, Sr.): 13.2 ppg, 7.7 rpg, 44 blocks. Thomas finishes well around the rim, making 65.9% of his shots this season. It’s imperative for Virginia Tech to force Clemson to take contested three-pointers. They must not let Elijah Thomas catch the ball deep in the paint, because he’s very likely to score. The Tigers won’t be as comfortable playing a three-point competition. The Hokies have to focus on slowing the game down, limiting their turnovers, keeping the ball out of the paint, and outshooting Clemson from the outside. Clemson is 10-2 at home this year, with their only losses coming at the hands of Virginia and Nebraska. Thanks for the jinx CC. Clemson will probably shoot 50+% from 3 point range tomorrow and burn Tech by 10. Let’s hope a little rest and preparation brings back some of the smoothness of a Robinson led offense. The passing for an open shot and the getting to the paint has been ok, but the lack of drive and dish with smoothness is the thing I’ve noticed. It’s like the offense herky jerky. It truly is a motor misfiring in one cylinder. But practice time can help smooth the rough edges. I know they work hard, and I hope it pays off. Assuming they will shoot better than NCState did (not hard to do) this will be our first real road test without JRob. Here’s hoping for the best. Don’t think we can afford to have any players go O-fer and not show up offensively if we want to win.